I wrote the following over a year ago, before I plunged into the madness. Shhhhh. Just look at it. 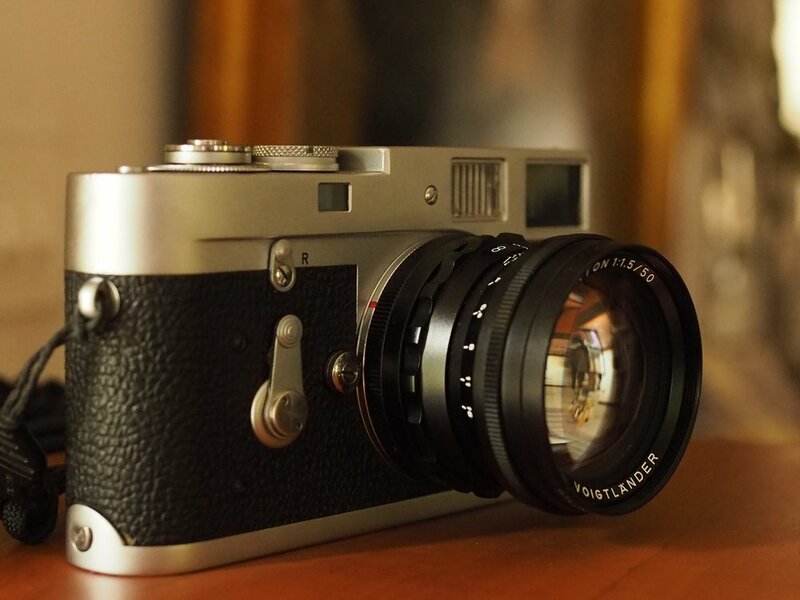 Why do I want a Leica M film camera? Honestly, I'm asking you, because I can't figure it out. I'm basically a digital native photographer: although I grew up in the last years of film's supremacy, I didn't get seriously into picture making until I bought a Canon digital point-and-shoot in 2004. From there, I followed the familiar camera-DSLR-mirrorless trajectory. At each step, the image quality got better, the cameras got more responsive. Now, with an Olympus OMD E-M10 as my daily driver, I'm far more likely to not see a shot than blow it because the camera couldn't. And yet. A mechanical Leica. Apparently, now I want a camera that costs money every time I release the shutter, that requires me to focus manually with the camera mashed against my face, not to mention set aperture AND shutter speed on my own (and since I'm looking at fully mechanical bodies, doesn’t even suggest what those settings should be), that needs to be disassembled after taking 36 frames (and forces me, right then, to decide what the ISO will be for the next 36). Also, it's heavier than my current kit. And it costs more. What the hell am I thinking? Whatever it is, I think it's been percolating for a while. From time to time over the last several years, I've started looking at metal-bodied SLRs on eBay before deciding I was just being silly. I had a lot of fun researching obscure lenses that might work on my NEX 5N (I once blew a whole night learning about Exacta-mount lenses) and I enjoyed using the old Olympus 38mm Pen half-frame lens that I bought from someone in Japan. Sure, it was a great performer above f2, but I really liked the mechanical solidity of it, a dense metal knuckle with a focus ring that felt good against the fingers compared to the plasticy stuff I was used to. I’ve long been interested in what I refer to in my head (though not, generally, out loud) as “knob feel” – the tactility of control surfaces. One of the main reasons I bought the E-M10 over the contemporaneous Panasonic GX7 was knob feel: the Panasonic’s control wheels had an unsatisfying clicky movement that I couldn’t abide. But a fine mechanical camera has knob feel all its own. The knobs and wheels and rings actually do something – they aren’t the disconnected surface of a virtual machine but physically linked to their purpose. This changes the way they feel, both in the fingers and in the mind. So metal. At first it was just for fun. Then just when I needed it. Then I needed it every day. And speaking of mind, I took a pleasure in that old half-frame lens that was entirely apart from its functional qualities, something more poetic than practical. What light had already passed through its glass? Whose fingers had focused it? Imagining the answers to these questions somehow enriched my experience of using the lens. And what stirs imaginings more than a Leica? Then there’s the harder-to-admit part. The credence in legend. The illusory connection to a tradition that encompasses some of the greatest practitioners of photography we have known. The ridiculous but irresistible sense of aligning one’s self with genius through the tools used by geniuses. Is there a pathos in this, an admission that I have not produced immortal greatness with the best tools of my day, and so I retreat to tools proven in another age? Well, let’s look out rather than in. I have never seen like this. I will never see like this. I fill this sadness with objects. Then there’s the soft Neo-Luddism that permeates our moment, with our reactionary gaze towards the vintage and authentic. Do I entertain ideas about how digital abundance erodes the thought I put into each frame? Do I harbor fantasies that shooting film will force me to contemplate, slow down, consider, and perhaps see more clearly? Do I imagine that each image will be more precious, will be imbued with some quality that is otherwise sacrificed to digital disposability? I confess, this does seem to be the case. Now, you might reasonably suggest that there are less torturous ways of dabbling in film and old cameras than joining a cult whose demands are as onerous as Leicaism. And I would retort that, first off, I've tried other mechanical cameras and they didn't do it for me, knob-feel-wise. And second, la la la, I can’t hear you. I don’t want a reasonable camera. I want one that satisfies my unreasonable hungers, that sings silently over the sadnesses of the everyday.